This cycling map highlights routes through campus, changing and shower facilities, location of lockers and bicycle sheds on campus. The nearest Hirebike locations are also located on the map. 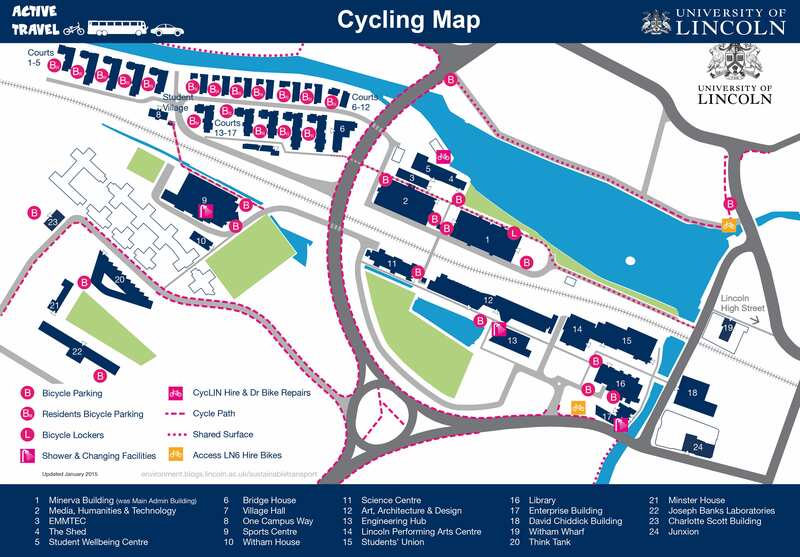 The University cycle hire scheme is known as CycLin and originally had 68 hire bikes available for students. For the 2014/15 Academic Year an additional 17 new bikes have been purchased – taking the total available to 85 – and further new bikes will be added to the fleet over the course of this year. Bikes can be hired for a term or for the full year. The annual fee is £40 for an older bike or £45 for a new bike. A deposit of £50 is also charged, but this is returned when the bike is brought back in good condition. Through-out the hire period the Dr Bike Team based in the Marina Building are available to offer maintenance for the hire bike. All bikes are also covered by third part liability insurance. If you have brought your own bike to University the Dr Bike Team offer free maintenance on Mondays. As of the 1st of May 2015, there have been some changes made to the membership pricing for Hirebike. It is now £20 annual membership for Hirebike (£10 renewal fee), which gives you the first 30minutes of every journey FREE, then £1 per hour. The alternative pay-as-you go option allows individuals to register for the scheme FREE, with an hourly charge of £2. To read more about the new pricing structure, visit hirebikelincoln.co.uk.